AURORA, Ill. (March 17, 2015) - After winning three consecutive Monster Energy AMA Supercross, an FIM World Championship, races for the first time in his career, Red Bull KTM''s Ryan Dungey will look to make it four in-a-row as he chases his first-ever 450SX Class win at Detroit''s Ford Field on Saturday night. Dungey''s Eastern Regional 250SX Class teammate, Marvin Musquin, is also in the midst of a three-race winning streak and, like Dungey, has hopes of taking home his first win in the Motor City. Both riders have seized control of their respective championships, winning four of the last five races, and will bring comfortable double-digit point leads into Detroit. Saturday night''s race will air live on FOX Sports 1 at 7:00 p.m. EST/4:00 p.m. PST. Live coverage from Detroit will also be available on the authenticated FOX Sports Go app. Media Day will take place Thursday, March 19, at 12 Noon EST at Ford Field, featuring Mafia Moto and RCH Soaring Eagle/Jimmy John''s Suzuki Factory Racing. •	Can Dungey continue his historic season by winning four straight Main Events for the first time in his career? Another victory would also equal his career high of six wins in a season. •	Mike LaRocco, Ricky Carmichael, Nathan Ramsey, and James Stewart have all won Detroit in both the 250SX and 450SX Classes. Can Dungey or Josh Grant join them? •	With four third-place finishes in the past five races, can Trey Canard earn his third win of the season in Detroit and close the deficit he faces in the championship? •	Chad Reed won the final three races at the famed Pontiac Silverdome. Can he get his first win at Ford Field? 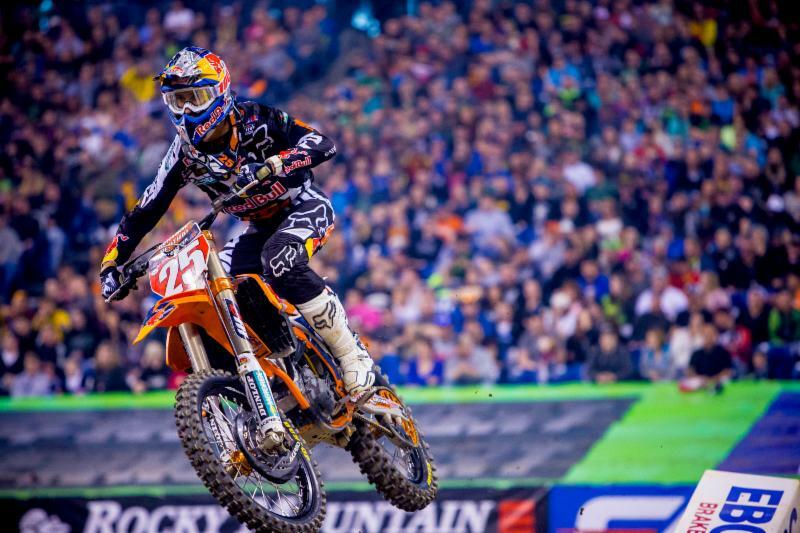 •	Can Musquin win four 250SX Class races in a row for the first time in his career? •	Defending champion Justin Bogle has been on the podium at each 250SX Class race this year but has not won a race. Can he win his first race in Detroit? •	How will Jeremy Martin, a winner this season, rebound after failing to make the Main Event last weekend? •	Can Joey Savatgy give Monster Energy/Pro Circuit/Kawasaki its first win of 2015? Dungey''s win in Indianapolis this past weekend, in which he led all 20 laps of the Main Event for the second time this season, extended his points lead to 45 over Team Honda HRC''s Canard and gives KTM 19 career 450SX Class wins. Dungey did capture the 250SX Class Main Event win in Detroit during his rookie season in 2007, and with a win on Saturday night he would become the fourth dual-class winner in the Motor City. He is the only rider in 2015 to finish inside the top-10 at every race and is currently in the midst of a 10-race podium streak. Team HRC Honda''s Cole Seely equaled his season-best second-place finish in Indy and with it moved to fourth place in 450SX Class season standings. The 450SX Class rookie is now just nine points behind GEICO Honda''s Eli Tomac, who suffered a crash in Indianapolis that resulted in an 11th-place finish. Seely challenged Dungey during the early stages of the race before eventually settling into the runner-up spot. "I thought I would have something for Ryan [Dungey] tonight, but I dropped back a bit. But I will take a second place," said Seely on the podium after the race. Giving chase to Dungey''s 45-point lead in the 450SX Class is Seely''s Factory Honda teammate Canard, who took over second in the standings three races ago and remains Dungey''s primary championship threat. Canard finished with an impressive third in Indianapolis following an 11th-place start and has two wins on the season combined with seven podium results. In hot pursuit of his first career title on U.S. soil, former world champion Musquin has four wins and a runner-up finish through five Eastern Regional 250SX Class races (identical results to his teammate Dungey over that span). Musquin and GEICO Honda''s Bogle are the only riders to finish on the podium at every race this season, but the Frenchman''s dominance in the win column has allowed him to open a 16-point lead in the championship standings. 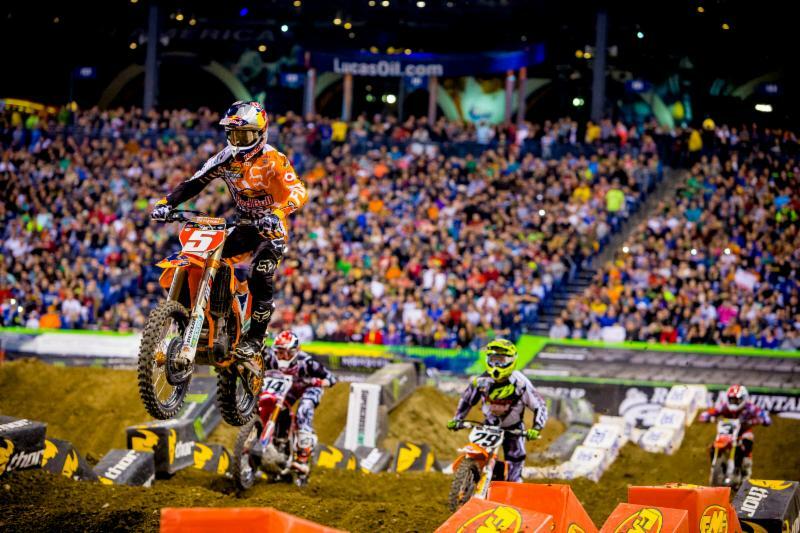 Musquin took advantage of a second-place start in Indianapolis to work his way into the lead on Lap 1 and eventually win by a 22.351 margin of victory. For the second time in his career, he has won three consecutive races. "My starts weren''t that great tonight, but I was able to make some great passes and ride aggressive," said Musquin on the podium. "The track was technical tonight and tough to ride. At one point, I looked back and couldn''t see the second place guy." Defending Eastern Regional 250SX Class Champion Bogle held on to his third runner-up finish of the season despite going off the track and crashing in the Main Event. Bogle''s trio of second-place efforts is complemented by a pair of third-place finishes, but the Oklahoma native is still in search of his first win this season. 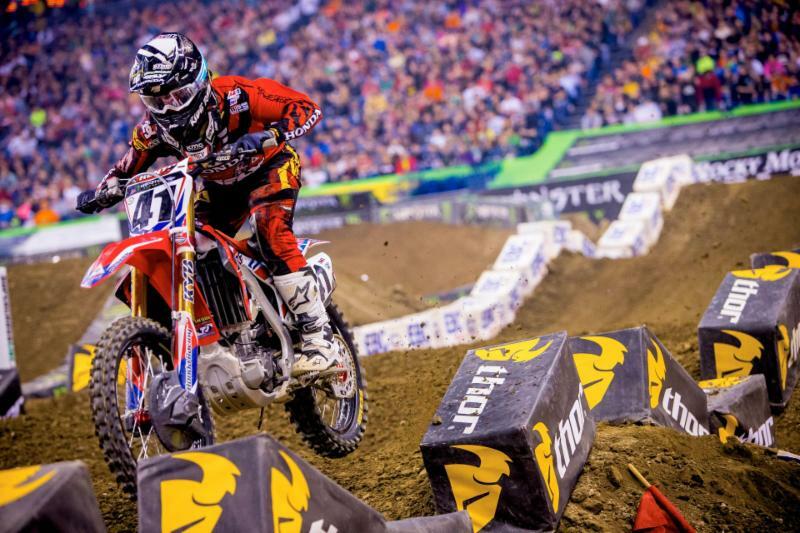 Last year in Detroit, Bogle finished second and hopes to pick up his first win at Ford Field. Bogle''s teammate RJ Hampshire took advantage of the late misfortune of Monster Energy/Pro Circuit/Kawasaki''s Joey Savatgy to ride to the first podium finish of his career. Prior to Indianapolis, the rookie, and graduate of the Ricky Carmichael Road to Supercross in AMSOIL Arenacross, had four top-10 finishes but had only cracked the top-five once. "I came into the season with the goal of making every Main Event, so to be on the podium is a great accomplishment," said Hampshire after the race. Hampshire moved up two positions in the season standings and now sits fourth overall, 11 points behind Yamalube/Star Racing Yamaha''s Jeremy Martin. For Martin, Indy was forgettable as the Main Event winner from the first race in Atlanta failed to qualify for the Main Event at Lucas Oil Stadium and fell from second to third in the points. HRT Racing Suzuki''s Vicki Golden, who is attempting to become the first female in history to qualify for a Monster Energy Supercross race, came within seven-hundredths of a second of qualifying for the "Fast 40" in Indianapolis, which would have transferred her into the night''s racing program. Confidence is growing for Golden each week, and she has her sights set on making the "Fast 40" during her Detroit debut. During last year''s 450SX Class Main Event in Detroit, Team Yoshimura Suzuki''s James Stewart captured his third race win of the season. The win, Stewart''s 48th of his career, tied him with Carmichael for second place on the all-time win list. Monster Energy/Pro Circuit/Kawasaki''s Adam Cianciarulo captured the third Eastern Regional 250SX Class win of his career. Tickets are available at the Ford Field Box Office, all Ticketmaster outlets, charge by phone (800) 745-3000, or online at www.SupercrossLive.com or www.ticketmaster.com. Practice and qualifying begin at 12:00 p.m. and the Main Event starts at 6:30 p.m. Total Access Passes are $200 Adult/Child; Gold Circle $50 Adult/Child; Lower Bowl $30 Adult/$15Child; Upper Bowl $20 Adult/$10 Child; Treadhead $15 Adult/Child. Headlining the 2015 Monster Energy Supercross television package will be the first-ever live FOX network broadcast from MetLife Stadium in East Rutherford, N.J., on Saturday, April 25 at 3pm E.T. FOX Sports 1 will broadcast 12 races live and FOX Sports 2 will broadcast 3 races live. Each race will include a next-day re-air on FOX Sports 1. In addition, the authenticated FOX Sports Go app will live stream each race. As a precursor to the live television, don''t forget to catch all of the pre-race coverage with Supercross Race Day Live presented by AMSOIL, which will stream on www.SupercrossLive.com from 12:50 - 4:30 p.m. local race time each Saturday during the season. Practice, qualifying, behind the scenes features, and key rider interviews will all be highlighted on the Supercross Race Day Live presented by AMSOIL webcast. For more information on the Monster Energy AMA Supercross, an FIM World Championship, please log on to www.SupercrossLive.com, the official website of Monster Energy Supercross. To follow Monster Energy Supercross on Facebook, Twitter and Instagram, log on to www.facebook.com/supercrossLivewww.Twitter.com/supercrossliveand www.instagram.com/supercrosslive. Subscribe to our YouTube Channel at http://www.youtube.com/supercrosslive. For all media requests, please contact Denny Hartwig dhartwig@feldinc.com or 630-566-6305. Feld Motor Sports, Inc. is the world leader in specialized arena and stadium-based motor sports entertainment. Feld Motor Sports productions include Monster Jam®, Monster Energy Supercross, AMSOIL Arenacross and Nuclear Cowboyz®. Feld Motor Sports is a division of Feld Entertainment®, the world''s largest producer of live family entertainment. Official Monster Truck Series only at Monster Jam. For more information on Feld Entertainment, visit www.feldentertainment.com. The weekly newsletter to help you learn more about technology and promotions.